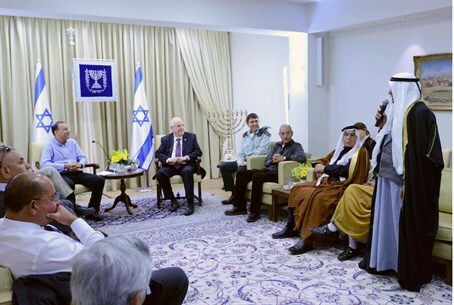 President Reuven Rivlin met with Bedouin community officials to discuss ways to enhance ties between Jews and Bedouins. President Reuven Rivlin on Wednesday met with a delegation of academics and dignitaries from the Bedouin community to discuss ways to enhance ties between Bedouins and Jews in the education and social spheres. Among the participants were the IDF's liason to the Bedouin community, Mansour Abu-Taha, Professor Araf Abu-Rabia of the Middle East Studies Department at Ben Gurion University, Sheikh Ibrahim Alamour, Sheikh Id Abu-Rashd, former MK Haim Oron, and others. Speaking to the group, Rivlin said that he had last week visited the Bedouin towns of Rahat and Houra, after the deaths of eight women who were on their way home from Jerusalem several weeks ago in a traffic accident. “I went to express my condolences with the family, and with Rahat, which is an important city in Israel,” Rivlin said. “I visited several schools and agricultural projects, and I was very impressed with the progress they have made. Among the concerns expressed by Rivlin's interlocutors was the lack of jobs for young Bedouin, especially college graduates. Asking Rivlin to take an active role in solving the issue, Professor Abu-Taha asked the President to “spread your presidential robe over us, and tell us we are all your children.” Others expressed concern over the lack of health facilities in Bedouin towns, and the need to improve education, especially in younger grades.